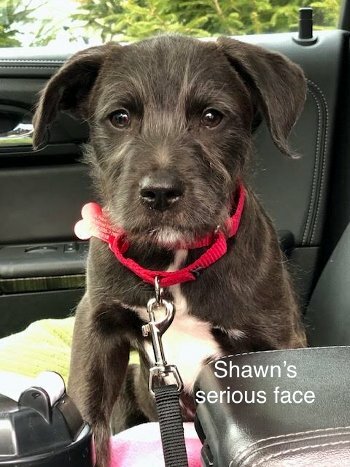 Scruffy Shawn is an adorable 10 week old Terrier/Boxer mix. Like his namesake from the TV show “Boy Meets World”, Shawn had a rough start to his life. Luckily, he and his motherless siblings were rescued, and they have spent time in foster care learning that people are kind (and fun!). At 12 pounds, this boy is growing quickly and we expect he will be between 45 and 65 pounds when fully grown. Shawn is playful, silly and active, but also loves a good snuggle, and has the cutest blissful expression when he’s being cuddled. This boy is ready to meet the world, and is looking for a loving home where he will get the love, attention and structure all puppies need to thrive.